Some of these are pure fun, but others have tragic stories behind them. According to legend, Kazan cats were brilliant mice hunters. In 1745, Russian Empress Elizabeth I ordered 300 cats, who became her furry guard and protected her chamber from rodents. 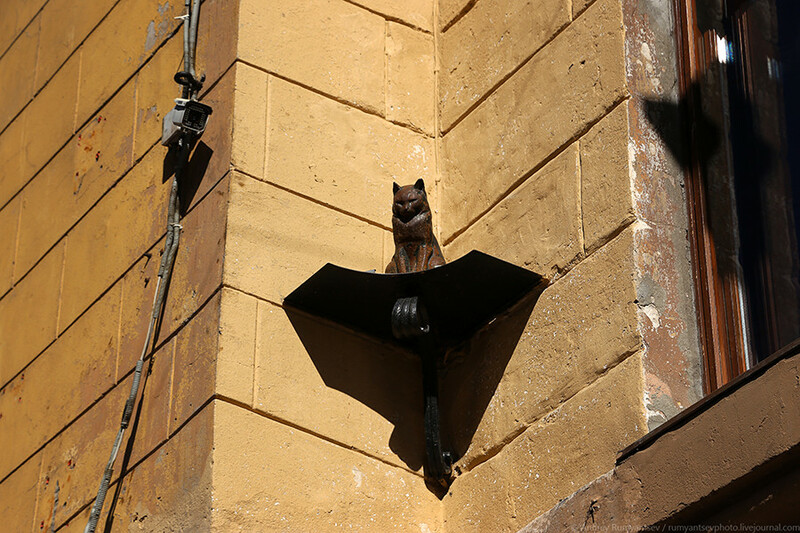 It’s believed the bloodline of these felines survives today in the cats that live in St. Petersburg’s Hermitage Museum. 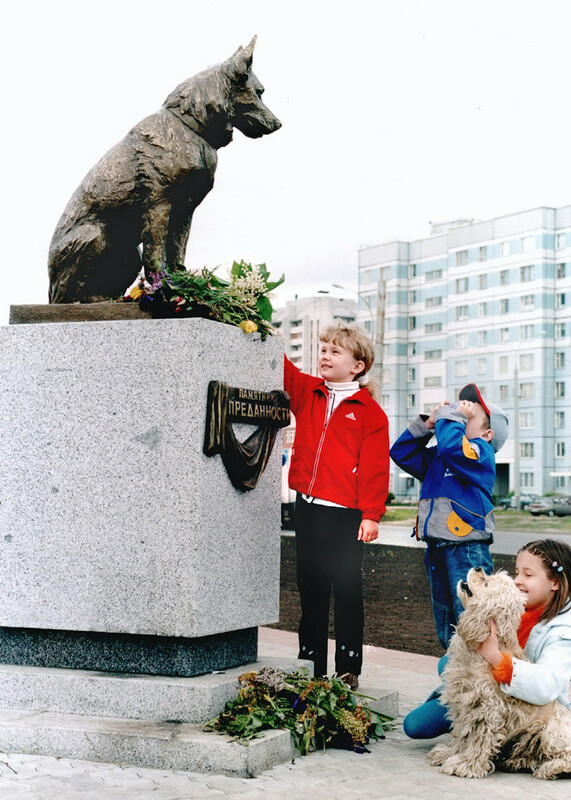 A monument located in the city of Tolyatti is devoted to Russia’s own “Hachiko,” a German Shepherd named Kostya. In 1995, his masters died in a car crash - but the dog survived. Afterwards he remained at the sight of the tragedy, rushing at passing cars in a bid to find his departed owners. In 2002, Kostya died in a nearby forest of natural causes. During the Siege of Leningrad, rats were a real pest for humans. They decimated grain stores and even attacked people. When the siege was broken in 1943, four carriages full of cats were sent to the city to cleanse it of the rodents - you could say the felines were drafted in to make the place squeaky clean. 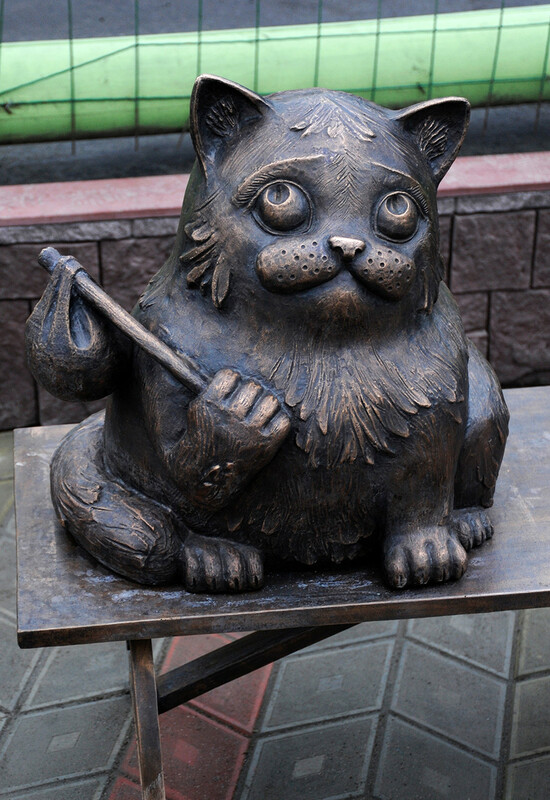 In memory of those brave pussies, a sculpture of a cat was installed in the city, sitting on a pedestal watching over the people. 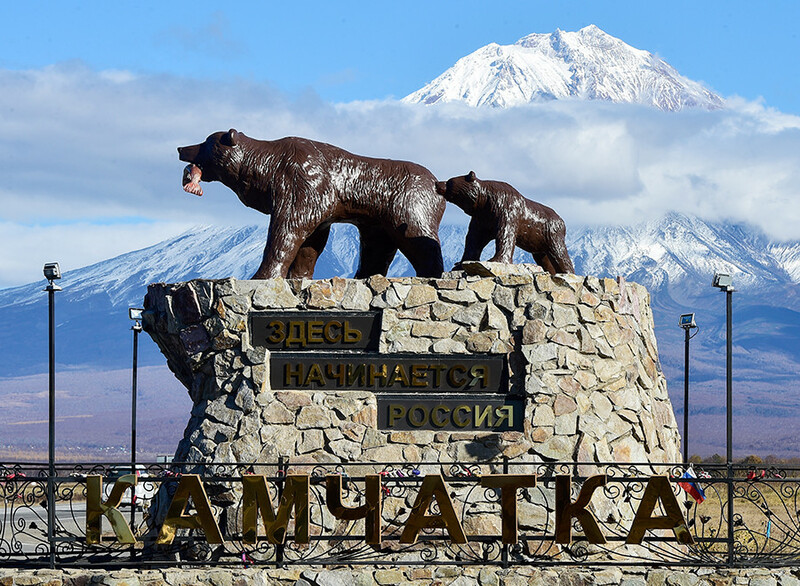 This sculpture of a mother bear with her cub not only symbolizes Kamchatka, but Russia as a whole. The words on the monument - “Here starts Russia” - remind the peninsula's habitants that they are not cut from the same cloth as those from the mainland. 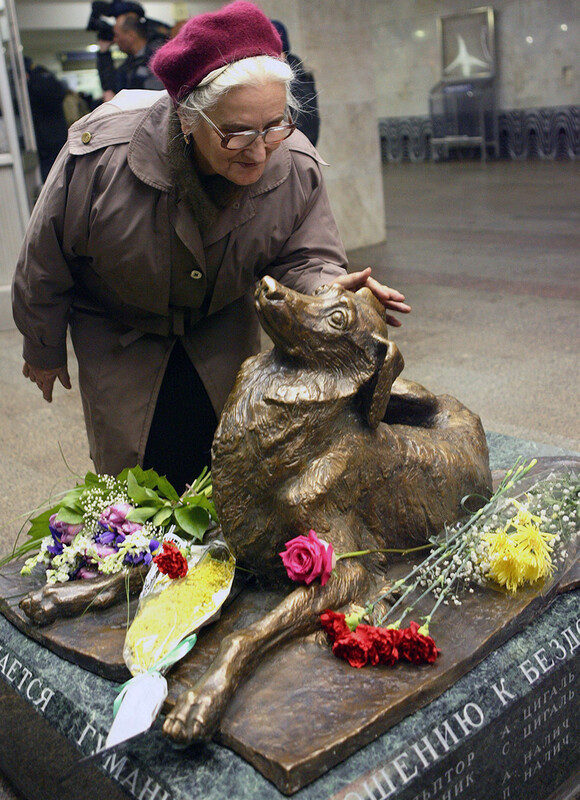 Malchik (“Boy”) was a mongrel stray dog that lived in Mendeleyevskaya metro station in Moscow - he was a local star. He was killed in 2001, when Yulia Romanova (while suffering from psychiatric problems) stabbed him with a knife. The monument calls for humane treatment towards all stray animals. 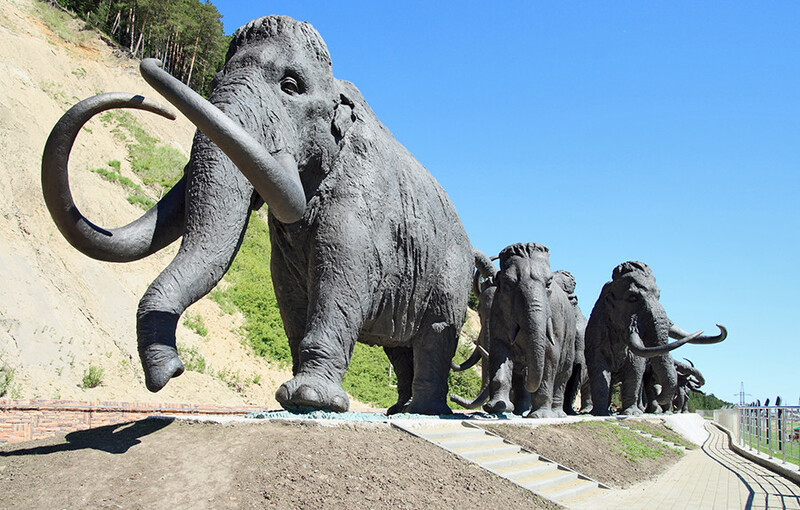 These 11 bronze mammoths are ready to cross the highway towards the city of Khanty-Mansiysk in Siberia. 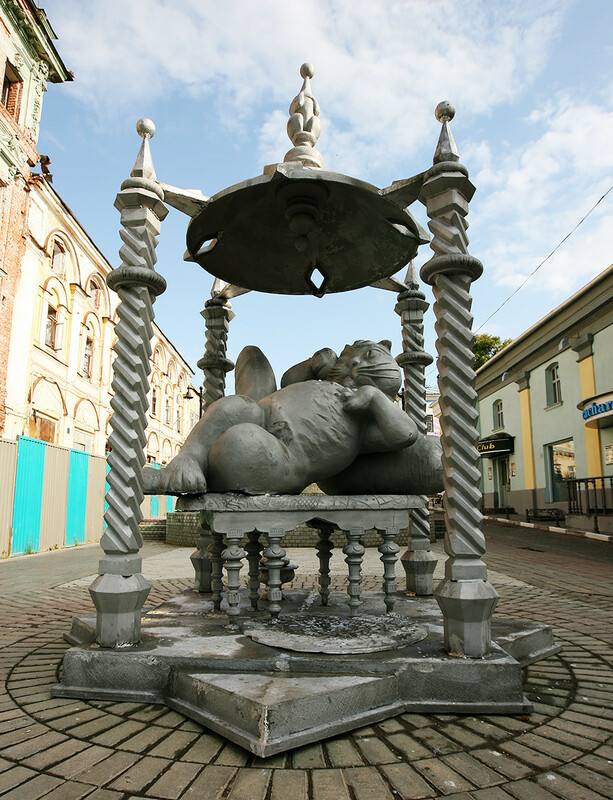 The sculpture composition was established in 2007 to honor the 425th anniversary of the city. Not all dogs sent into the space were as lucky as Belka and Strelka. The first animal to orbit Earth, the stray dog Laika was sent into the unknown on the Sputnik 2 spacecraft on Nov.3, 1957. Sadly, within hours she died from overheating. In 1987, the Sinishiny family returned home from vacation to the northern city of Murmansk. 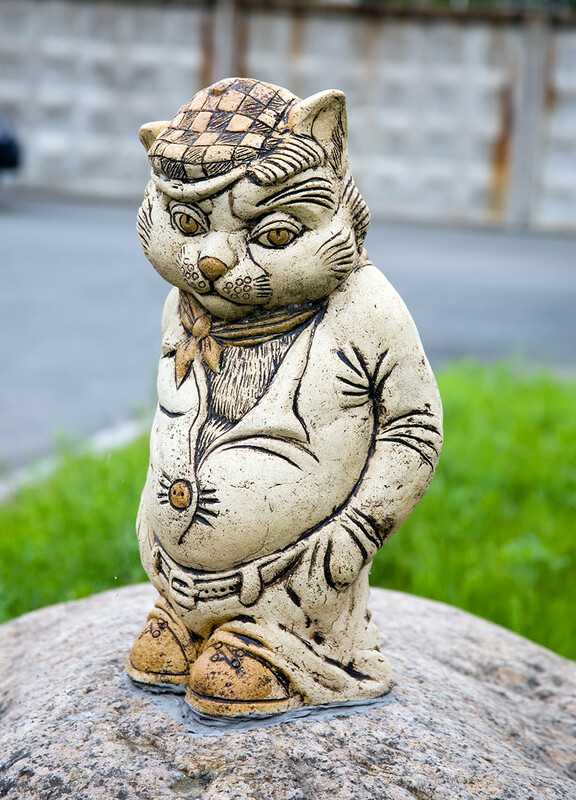 During their stop in Moscow they lost their cat Semyon. They were extremely surprised when six years later the feline appeared on their doorstep. Exhausted skinny Semyon had journeyed 2,000 km to find his masters. Such a heroic deed wasn’t ignored by the Murmansk authorities, and a bronze of Semyon is now one of the city’s attractions. 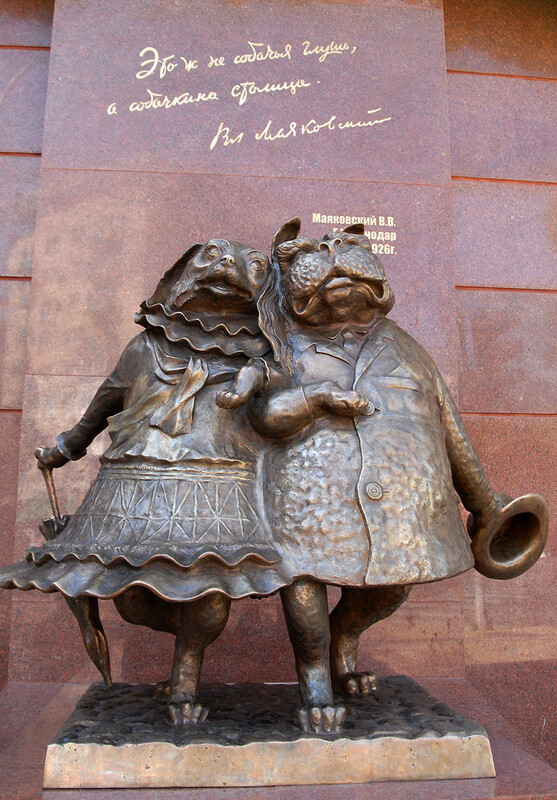 A monument to the humble laboratory mouse is located in front of the Institute of Cytology and Genetics not far from Novosibirsk. 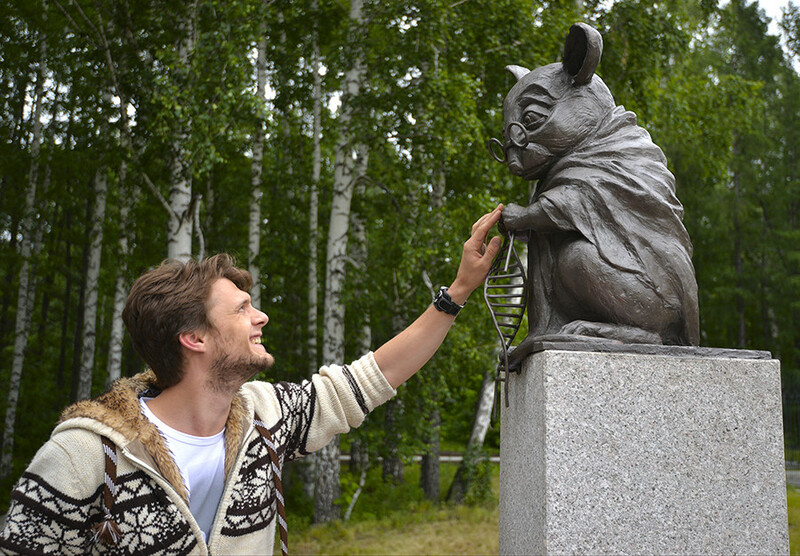 According to Nikolai Kolchanov, the director of the institute, the monument commemorates the sacrifice of mice in genetic research used to understand biological and physiological mechanisms for developing new drugs and curing diseases. 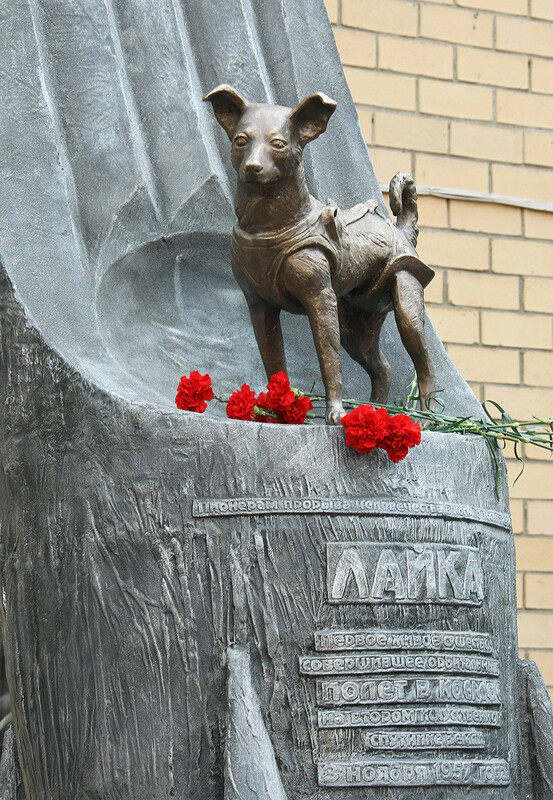 When Vladimir Mayakovsky visited Krasnodar in 1926 he was so taken by the number of stray dogs there that he called the city the “dog’s’ capital.” Many years later in 2007, a funny monument was opened in Krasnodar thanks to the famous Soviet poet. 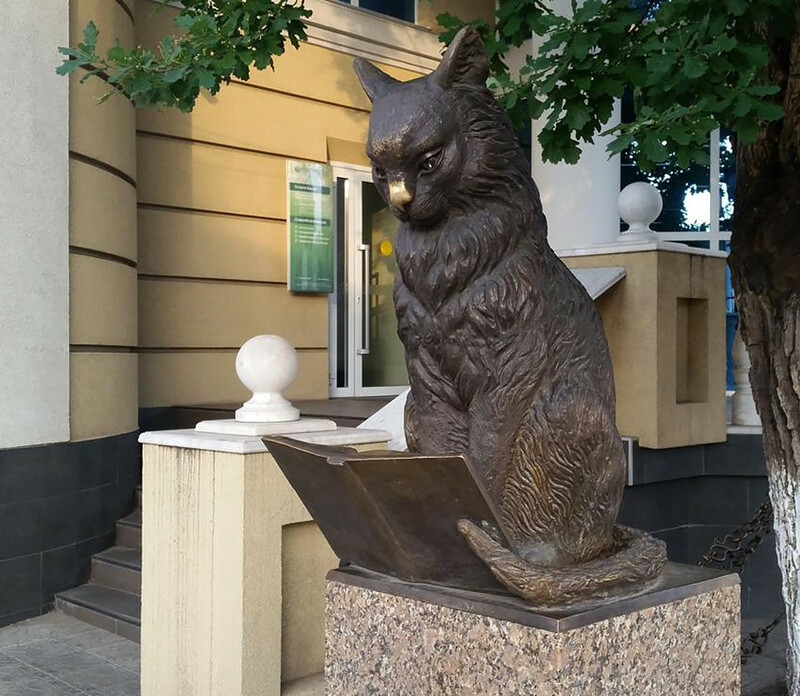 Orenburg’s monument to a cat in glasses reading a book is dedicated to the hero of Alexander Pushkin’s poem Ruslan and Lyudmila - Wise Cat. In Pushkin’s work he tells tales and sings songs while walking along the oak tree. Locals believed that the old oak where the monument is found is the one Pushkin was referring to. Pushkin used to sit there for long periods of time during his visits to Orenburg. Bobka was a real dog from the late 19th century who assisted Kostroma’s firefighters, rescuing people and their belongings from raging blazes. His heroic deeds have not been forgotten - in 2006 a monument was erected in his honor. 14. Make Way for Ducklings! 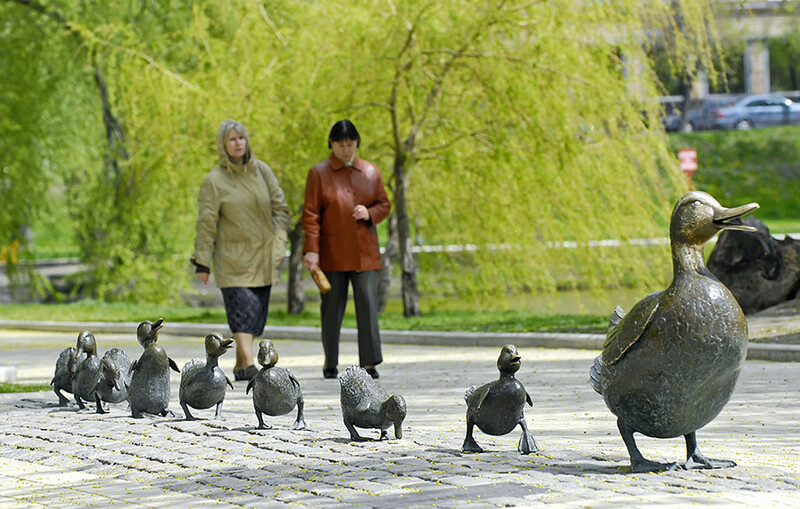 This sculpture of a mother duck and her eight ducklings was made to honor the Make Way for Ducklings! book by Robert McCloskey. The artwork is a copy of the original which exists in Boston and was unveiled by Barbara Bush to Raisa Gorbacheva in 1991 as a symbol of Russia-U.S. friendship, and was placed in central Moscow. 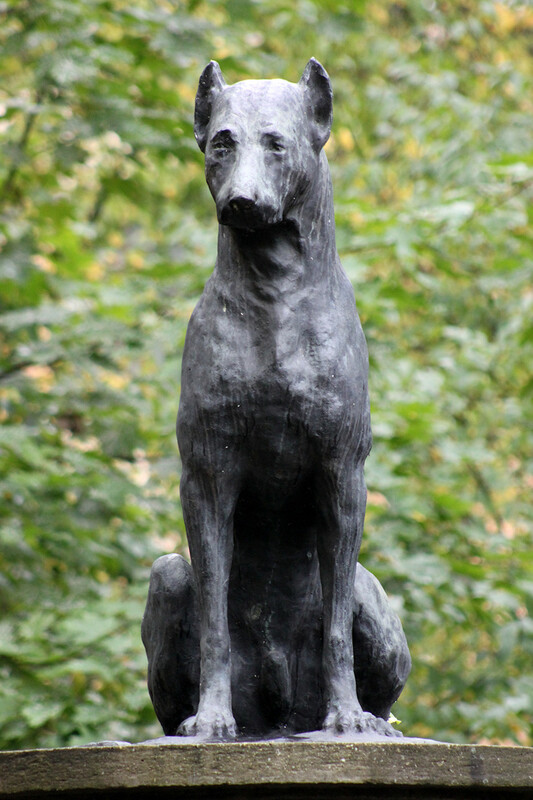 Made in 1935, the monument to Pavlov’s dog in St. Petersburg is one of the oldest monuments to animal in Russia. It is devoted to animals that were used in studies, scientific tests, and experiments. 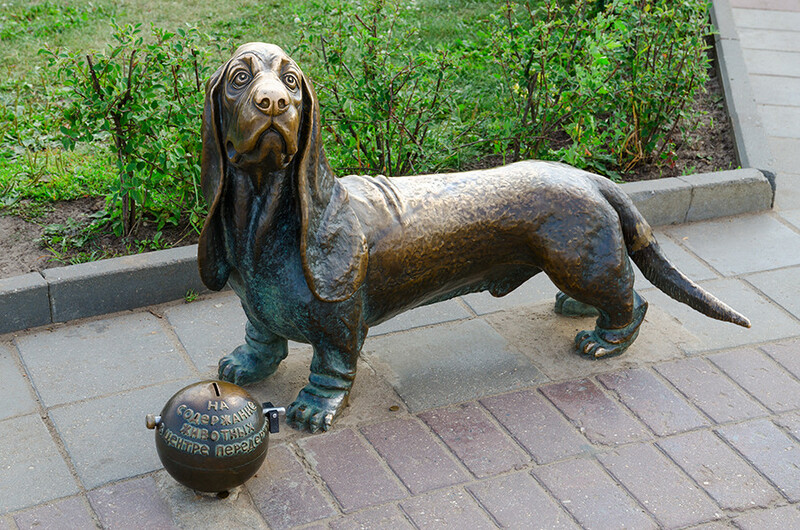 Do you know the seven most famous dogs in Russian culture? Find out here. From Marx to Michael Jackson: Which foreigners are honored with a statue in Russia?